As the school year rapidly approaches, many of you teachers out there will have your hands full with assessments, IEP development and planning, all in addition to the excitement of getting to know your new students. Verbal Behavior Targets: A Tool to Teach Mands, Tacts & Intraverbals can save you tons of time and energy by providing you with comprehensive word lists that can be used for both assessment and teaching. This is a vital resource for anyone teaching language to a student with Autism or speech and language delays. The book consists of words and word combination lists categorized by word families covering nouns including people, places, events and things inside and outside plus verbs, adjectives, adverbs, verbs plus nouns, nouns plus nouns, fill in the blanks, verb tense, receptive instruction, categories, features, functions and topics for conversation. 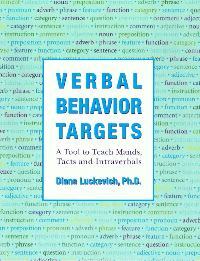 This week only, you can save 15% on Verbal Behavior Targets by entering the Promo Code BLOGVBT9 at checkout. *Offer expires on August 14, 2012 at 11:59 pm EST. Not compatible with any other offer. Be sure there are no spaces after the Promo Code when you enter it at checkout. Written by: Different Roads to Learning on August 7, 2012.on August 6, 2012. This entry was posted in ABA, Academics, autistic spectrum disorder, Difflearn Promo Code, Pick of the Week, Speech & Language and tagged ABA, autism education, autistic spectrum disorder, conversational skills, Early Intervention, language development, Resources, special education, teaching tools by Different Roads to Learning. Bookmark the permalink.